Its been a long time I am updating my blog. We/I took a break and life was pretty busy, moving to a new apartment and settling down took us two tiresome weeks. Excited about our new apartment, it has a balcony.... and can't wait for Summer!! Any one who recently visited India will know about this famous theater snack which is so popular amongst all the ages. Yes, I am talking about American Butter Corn. is famous in most of the movie theaters all across India especially in Andhra Pradesh. Some how I managed to bring that taste here, I make this for prasadam/offering to Saibaba. This recipe has less fat from one tbsp butter, It is a good source of fiber as we make from fresh corn and here goes the simple recipe. Bring 4 cups of water to boil, to this add salt. Break fresh corn into two or three pieces and boil the cobs for 10 mins. Peel corn from the cob. Take a saute pan, heat it on medium high, add butter to that. Now add corn, freshly ground black pepper, pinch of salt and chilli powder. Mix well so that excess water is evaporated, at the end mix in some chopped parsley or cilantro. You can play with the flavours here by adding different kinds of herbs and spices. This looks so healthy & tasty! Looks delicious padma... As u said, its now a hit in chennai too.. I had that when i went to India this time... Its so wonderful! Oh those kernels are so plump and jucy! Lovely pic as usual. I've tagged you on JerseyBites. Please come and see. Wow this looks simple and yummy. This is sooo simple,yet mouthwatering, lovely! you had me at butter. 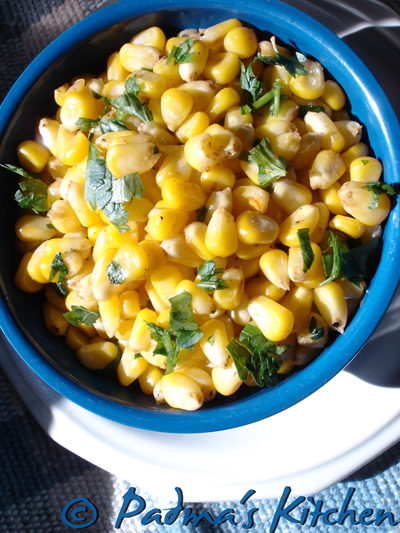 i wish it was still fresh corn season in new jersey...sigh. it looks yum and delicious! I tried it with canned corn (premium stuff) and it turned out fine. My son said it was little bland. But was well received by my hubby and cousins. This dish looks delicious!! Love sweetcorn.